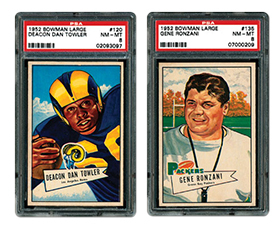 One could make the argument that the 1952 Bowman Large football card set is the most iconic gridiron issue of all. This 144-card set seemingly has it all, from serious difficulty to absolutely outstanding artwork. The eye-appeal of this Bowman production rivals any set ever made, regardless of sport. We celebrate this popular set by talking to the people who collect it and finding out why it has a special place in the hobby. Collecting the 1962 Venezuelan Topps Baseball Card Set – Tarjetas Imposibles? Claro Que Si! As collectors become more advanced in their pursuits, they often seek items that offer true scarcity. 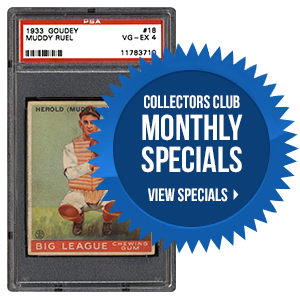 Sometimes, the most attractive collectible is one that blends hobby-wide appeal with rarity. 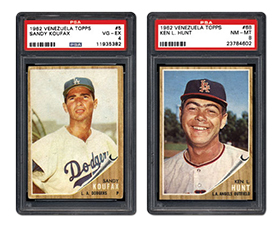 That is the case with the 1962 Venezuelan Topps set. The cards look familiar, but they are anything but common. In the next article, we take an in-depth look at this seldom-seen set. During the 1980s, not only was the hobby in full bloom, but the world of wrestling became extremely popular with mainstream fans. The names were unforgettable, from Hulk Hogan to Ric Flair to Junkyard Dog. It became so popular that products featuring the characters seemed to be everywhere, from t-shirts to trading cards. 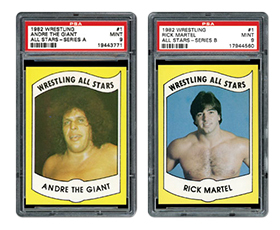 In the following piece, we revisit the 1982 Wrestling All Stars Series A and B set, the first mainstream issue in the U.S. Which of the following football card sets do you feel is the most iconic? Many new set composites have been added as we continue to whittle down the very long list of pending sets. 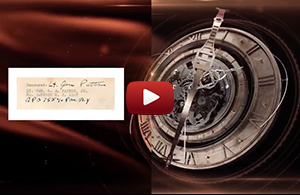 To view the list of recently added set composites, please visit the PSA Set Registry News page. As always, your patience and continued support is greatly appreciated. Should you have any questions, please feel free to contact us at [email protected].